Today I have the great pleasure to showcase 2 new releases of 2 mazing brands. *PosESioN* and !:Lybra:!. Lemme start with the incredible glasses. I would like to thank my sweet briother Dahriel for the opportunity to pose with the incedible Absi for the vendor of the “Idol” glasses 🙂 . Now I would like to drag the attention to the amazing dress I am wearing. The greatest news on that one are… Lybra Rage is back! Formerly known from the brand House of Rage, where he was designing together with Topaz Joubert and LovelyMiwako7399 Menna. He now is back and opened his own brand !:Lybra:!. I was totally amazed as he sent me one of his firt dresses called “Vex”. The incredible short dress is a fireworks of textures and and stunning arrangement of mesh and prims. I love how the new mesh and the ‘older’ prims work together so well and give the dress some life. 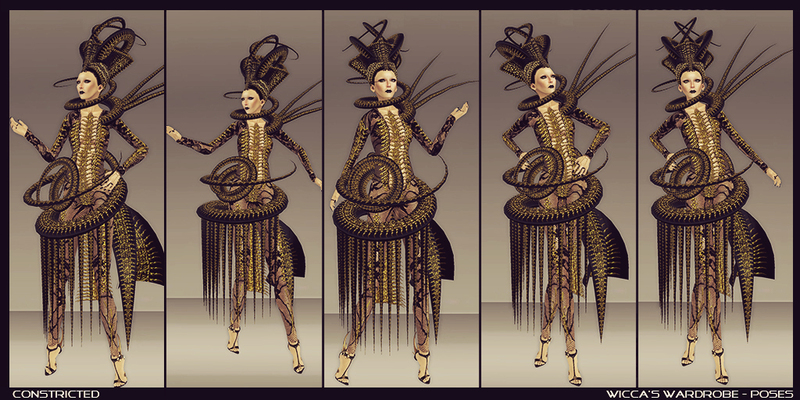 The flexible prims go so well with the mesh corset and I love the combination. For the jewelry I took parts of the new “Bali” gown from Finesmith. The collar and the high waist belt went perfect with the “Vex” dress of !:Lybra:!. The “Rose” belt and collar are decorated with amazing roses at the sides and wonderful huge gemstones in the front and in the back. The skirt is very flexible and it looks like it would have many parts that go down from the waist. For me the dress really was something special in the whole TRPH #4. The huge “Lovelyn” hair, that for me totally goes with the “Poems” dress, comes from EMO-tions. The “Dawn” necklace as well was made by the hand of Mirja Mills, owner and designer of EMO-tions. Loki was an immortal, some even thought him to be a kind of evil god. In fact he was a magician who simply stole the life from others. Being a handsome man, he liked the girls wooing over him, wherever he met them. But he did not really care for the women he could have easily. And he could get quite obsessed with the ones that ignored him. Once, his eye fell on a very pretty girl and he thought her an easy pray for his looks and charms. But she did not fall for him. Always polite, she turned him down. He sent her flowers, he sent her gifts and she always thanked him heartily – but her heart did not warm up to him. He got mad at every man around her, even her brothers and made their lives difficult wherever he could. But that only made her care more for those who suffered his magical interferences. Loki got so frustrated about not getting his will, he decided to make her his by force. He weaved a gown from cobwebs and added shiny mirrors made from frozen tears. When it was ready, he went to the girl under the pretext of saying goodbye. She let him in and accepted the farewell-gift. He begged her to try it on and she did. But as soon as she looked into one of the mirrors, she felt her soul being drawn into one of the mirrors. Her body stood there like a statue. Loki snatched the mirror, her soul was trapped in and looked at her. “Now you are mine at last!” He cried out in triumph. She just looked at him with such a sadness, that what was left from his heart broke. Feeling he did something wrong for the first time in aeons overwhelmed in and he broke the mirror, and so the spell and let her go. Having returned to her body she felt like she had fell asleep for some seconds. Looking at Loki clutching a piece of mirror in mental agony. He cut his hand and as his blood touched the magic mirror, some very old magic came to life. He was granted a wish. In his state the only thing he wished for was to be loved and cause no more harm. He dropped dead to the floor – because this is the only way to grant someone never hurts somebody else again. 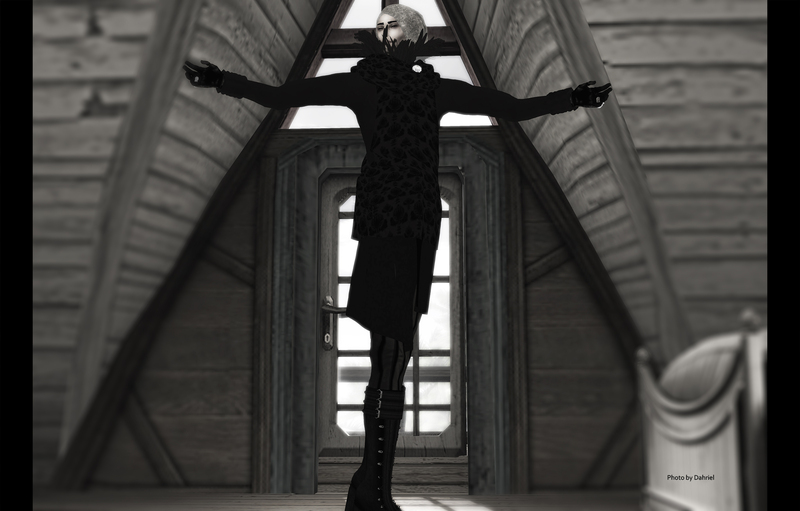 Wicca’s Wardrobe: LOTD 03/24/2013 – My First Pose Set!!! 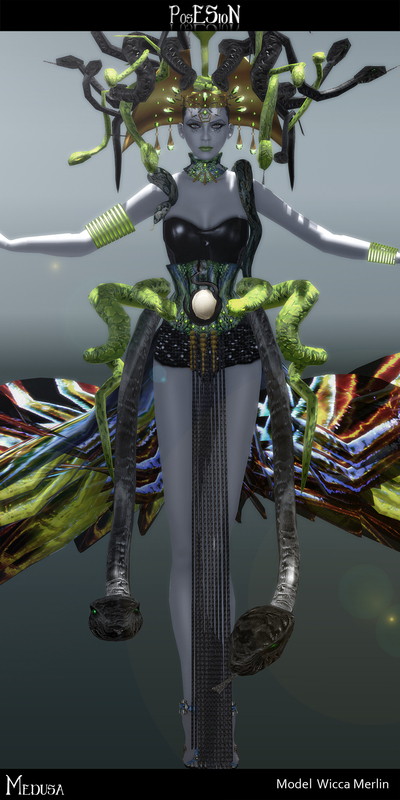 The skin is out of the new E-Clipse line of Silken Moon. The tone for this post is the ‘bisque’ and the type would be the ‘canvas’ skin. I really fell in love with the look that has no eyebrows at all. To see all the skin tones I will add the vendor picture mal made for the ‘canvas’ skin type. The look is more a simple casual one, but especially this simple and clean casual look I liked a lot. The jacket and the jeans are from M.o.w., the wonderful necklace is a tattoo layer, that was made by Malicia Python. For the shoes, I went with one of the amazing designs of Diktator. Like I said before, for this post I only used 2 or them and you can buy them HERE (http://maps.secondlife.com/secondlife/Napf/61/35/40) But It feels kinda good to have created something on your own and that’s why I wanted to share.